20 hours Is Canada hosed? Is Oil Due For A Correction? Though it has been an exciting week in oil markets, prices have stabilized in late week trading. Oil prices held steady on Thursday and in early trading on Friday after a top Saudi official said that oil production would remain flat in July compared to June and that Saudi Arabia does not want to oversupply the market. 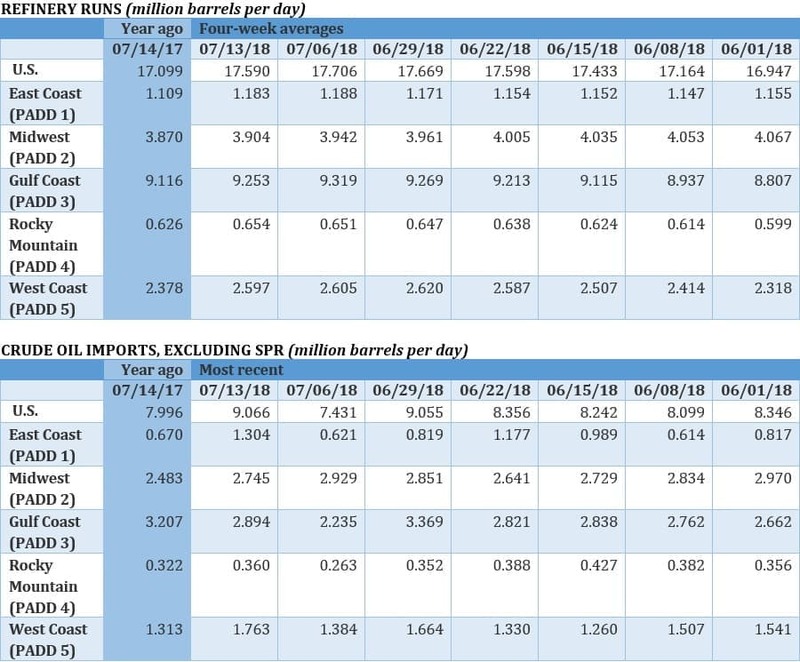 Previous comments suggested that Saudi Arabia would ramp up to 10.8 million barrels per day (mb/d) in July, but instead the Saudis will keep output at 10.5 mb/d. Trump ready for $500 billion in tariffs on China. President Trump said that he’s ready to put a tariff on every single Chinese good coming into the United States. “I'm ready to go to 500,” the president told CNBC, referring to the total dollar amount – $505 billion in 2017 – of U.S. imports from China. The comment does not indicate an official policy change, but suggests the White House is willing to go to extreme lengths in its trade confrontation with China. 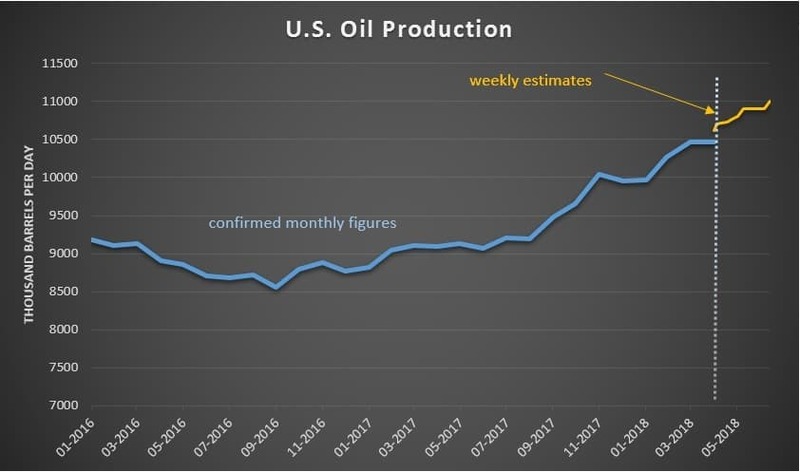 Shale production continues to rise. U.S. oil production hit 11 mb/d last week, a new record high. A separate EIA report predicts that shale output will grow by another 143,000 bpd in August, compared to July. Gains will come from the Permian (+73,000 bpd), the Eagle Ford (+35,000 bpd), the Bakken (+15,000 bpd), plus smaller contributions from elsewhere. Meanwhile, the number of drilled but uncompleted wells (DUCs) increased by a massive 193 in June from a month earlier, most of which were concentrated in the Permian basin. The DUC backlog continues to swell as the Permian suffers from pipeline bottlenecks. PDVSA to see two upgraders undergo maintenance. Two of Venezuela’s four oil upgraders are slated to go offline for maintenance in the next few weeks, according to Reuters. The upgraders process heavy oil from the Orinoco Belt into an exportable form of oil, and they have a combined 700,000 bpd of processing capacity. 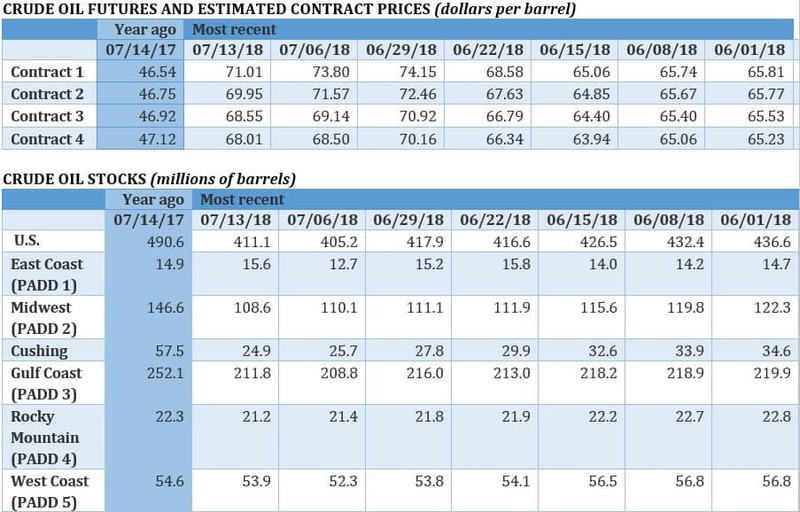 The maintenance for the two upgraders throw up another obstacle for Venezuela, which saw its total oil production fall to just 1.34 mb/d in June. U.S. Congress weighing legislation to speed up LNG exports. The U.S. Congress, in an effort to undercut Russian in Europe, is looking at legislation to accelerate LNG exports. The bill would also authorize sanctions on Russian energy projects, including the Nord Stream 2 pipeline. Midland discount deepens on Permian pipeline woes. The WTI Midland discount relative to Houston widened to as much as $15 per barrel this week and the odds of it returning to single digits before late 2019 seem to be vanishing. Meanwhile, Plains All American (NYSE: PAA) saw its request for an exemption from the Trump administration’s tariffs on imported steel declined. The rejection could raise the cost of a crucial Permian pipeline project, the Cactus II pipeline, which will carry nearly 600,000 bpd of Permian oil to Corpus Christi and is expected to come online in the third quarter of 2019. Bakken crude enjoys higher prices. The completion of the Dakota Access pipeline in 2017 has provided a boost to the Bakken, which used to trade at a steep discount to WTI because of a shortage of midstream capacity. Bakken Clearbrook, a hub in Minnesota, traded at a $16-per-barrel discount to WTI in 2013, but last month it sold for a $2-per-barrel premium. “That is enormous when you are looking at what is happening in Midland, Texas, where they are selling at a $9-$19/bl discount,” said Lynn Helms, director of the North Dakota Department of Mineral Resources, told Argus. Brent falls, making it attractive to Asian buyers. Reuters reports that oil cargoes from Europe, the Mediterranean and Africa have suddenly become attractive to Asian refiners because Brent fell relative to the Dubai benchmark. As oil from the Middle East becomes a bit scarcer on falling Iranian exports, there is somewhat of an arbitrage opportunity in moving oil from the Atlantic basin to Asia. Gulf Coast oil export terminal planned. Enterprise Products Partners (NYSE: EPD) announced plans to build a massive oil export terminal on the Texas coast capable of servicing very large crude carriers (VLCCs). The dock would be extended out from the coastline into deeper waters. The project could cost $1 to $2 billion and take several years before it can be completed. Norway workers strike ends. Norway’s oil workers ended their strike this week after the union reached a deal with employers. A field run by Royal Dutch Shell (NYSE: RDS.A) was briefly shut down.